Rare concrete fountain by Willy Guhl for Eternit. Fabricated out of cement. Great sculpture and object. Bowl has factory drilled holes to allow water to pass through. Stunning piece. Fantastic cement bowl by Swiss architect Willy Guhl for Eternit. Great tabletop bowl or planter. Very unique. Excellent condition. Willy Guhl "Diablo" shaped concrete pots. Multiple sizes and quantities of each available. A Willy Guhl planter stamped 61. A great object which can be used both indoors and outside. A sculptural piece of 20th century design. Small chips to the base of the planter. 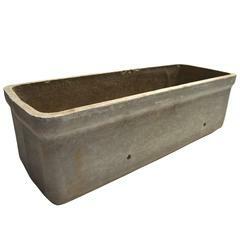 Willy Guhl planter on cone shaped base. Wonderful patina Multiple quantities and sizes available. Various shades and wonderful patina hourglass Diablo pots by Willy Guhl. Priced individually. Measures: 37.5" $2800 31" $2400 25" $2400. Smaller in size but large in style. 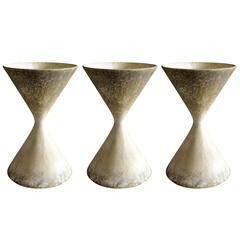 Willy Guhl concrete pots. Classic hourglass planter by Swiss designer Willy Guhl for Eternit. Gorgeous patina to cement. Overall good condition, with small damages on the bottom. Unique hexagon shaped planter by Swiss architect Willy Guhl. Great patina. Two available! Sold individually.